That’s quite a work of art, isn’t it? I’m still in shock that I made it. 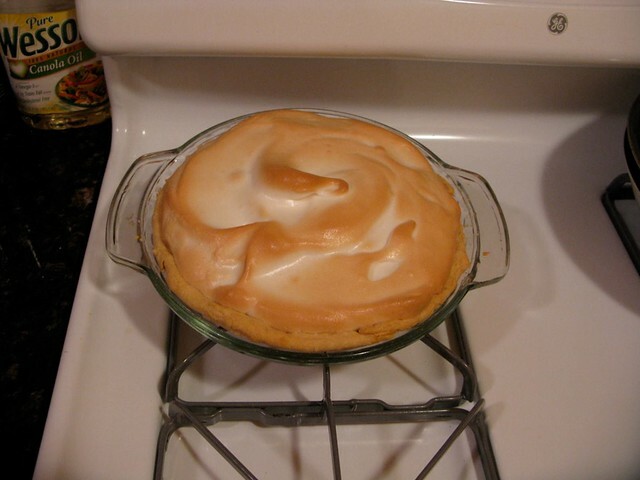 Meringue pies always seemed somewhat daunting to me: what with rolling the pie dough, making the filling and then making the meringue and browning it just so. I don’t think I would’ve attempted this kind of pie if it hadn’t been featured in Kim Severson’s “Spoon-Fed.” Placed as it was at the end of Chapter Two (a chapter called “Lemonhead”) I made a mental note to go back and make it some day; and then, as you’re very aware at this point, I found Meyer lemons at my local grocery store. 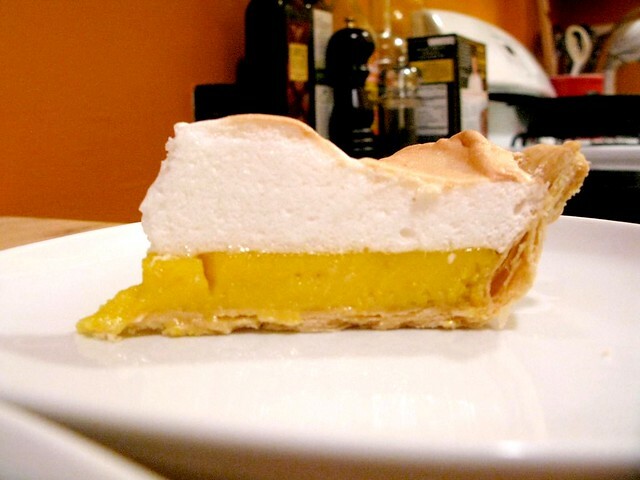 So I bought a bunch and made all the food you saw in the previous posts and then, at last, made this Meyer Lemon Meringue PIe. And Lordy, Lordy did this pie win raves. Craig, upon his first bite, exclaimed: “Whoah, it’s light as air!” And our friend Rob (whose last name is Meyer but is in no way related to the Meyer lemon industry, as far as we know) took a taste with his wife Kath and wrote me the following in an e-mail the next day: “That was honestly one of the best desserts I’ve ever had.” It’s in writing, folks. So here it is, a pie that comes courtesy of Kim Severson by way of Lindsey Shere (the pastry Chef at Chez Panisse) and Marion Cunningham (whose pie-crust recipe this is.) It’s called a “No Fear Pie Crust” and it’s “no fear” because it’s made with just shortening, no butter. Because of that it’s much easier to roll out (butter can get melty and gloppy). I was worried at first that no butter in the pie dough would make for a flavorless pie, but for this pie in particular the all-shortening crust worked really well; and it truly was a cinch to roll. So here you go and I promise, this is it (at least for now) with the Meyer lemons. 1. Combine the flour and salt in a large mixing bowl. 2. Fill a 1/3-cup measure with shortening. 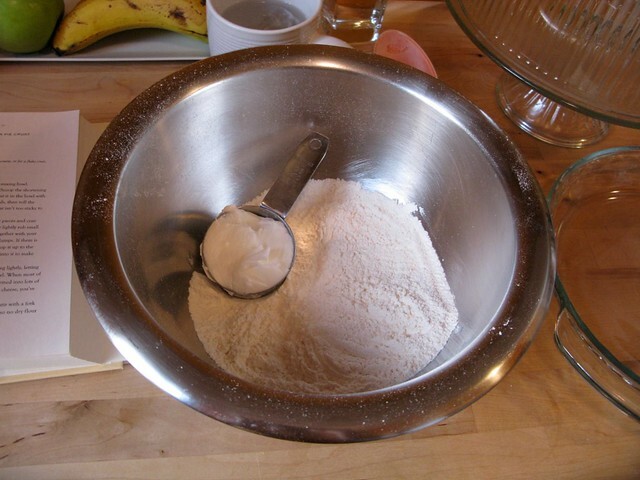 Scoop the shortening out of the cup with your fingers and put it in the bowl with the flour. Rub some flour on your hands, then roll the shortening around in the flour so the fat isn’t too sticky to handle. 3. 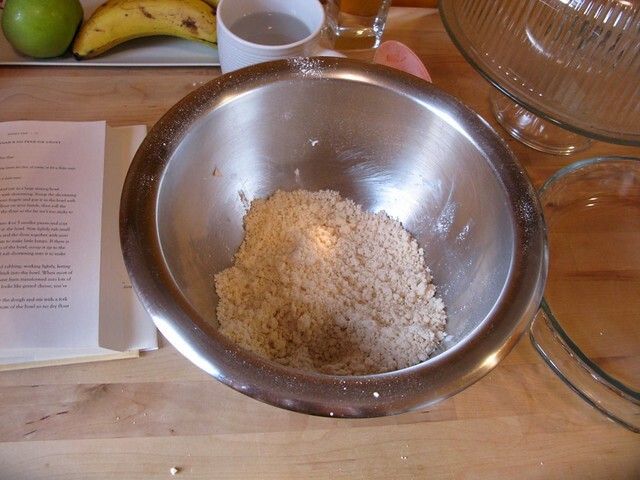 Break the shortening into 4 or 5 smaller pieces and coat them all with the flour in the bowl. Now lightly rub small pieces of the shortening and the flour together with your fingers for about a minute to make little lumps. If there is loose flour at the bottom of the bowl, scoop it up to the top with your fingers and rub shortening into it to make more lumps. 4. Continue scooping up and rubbing, working lightly, letting the bits of shortening fall back into the bowl. When most of the flour and shortening have been transformed into lots of little lumps and the dough looks like grated cheese, you’ve mixed enough. 5. Sprinkle the cold water over the dough and stir with a fork all around the sides and bottom of the bowl so no dry flour remains hidden. Stir until the water is mixed into the flour and has disappeared. 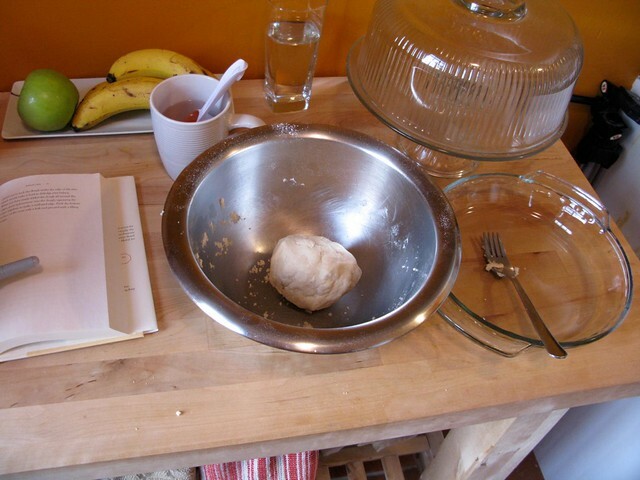 Reach down to the very bottom of the bowl and gather up all the dough. Pat and press the dough until you have a ball of dough. If some of it is still so dry that pieces fall away, sprinkle that area with a little more water and gently press and pull the dough apart, sprinkling a little more water on it. Pat it into a ball again. 6. Sprinkle a large cutting board or a countertop lightly with a small handful of flour. Spread the flour into a circle bigger than your 9-inch pie pan. Put the dough in the center of the circle of flour. Flour the rolling pin. 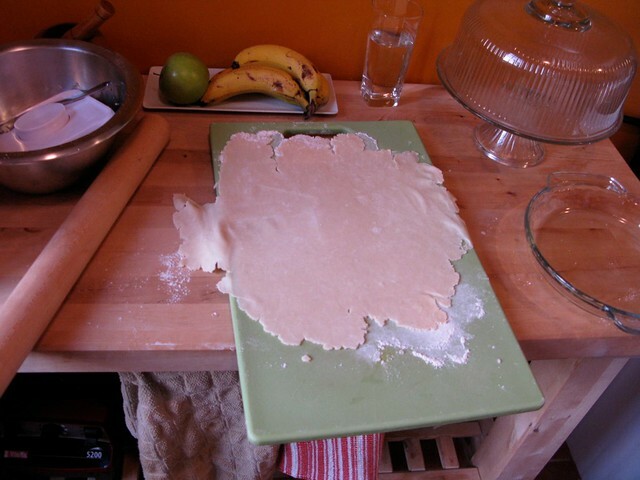 Flatten the dough a little with the pin, then begin rolling from the center out to the edges to make a circle. Don’t roll back and forth. Move the dough now and then to make sure it isn’t sticking. 7. If it is sticking, slide a metal spatula in a wiggling motion under the dough to loosen it. Sprinkle more flour on the surface, then continue to roll the dough into a big circle, about 1-1/2 inches larger all around than your pie pan. 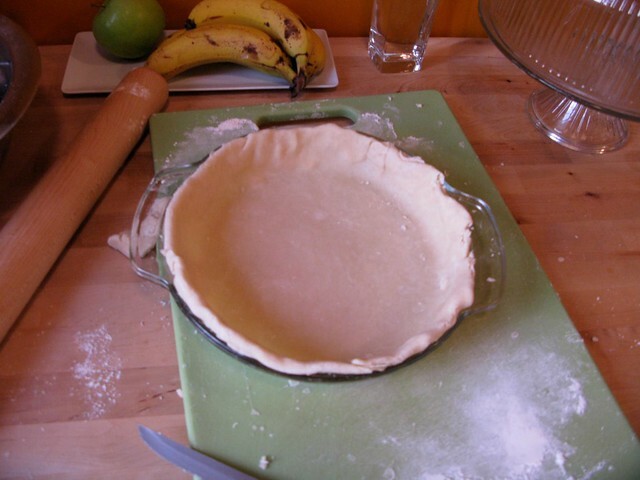 To make sure, put the pie pan upside down in the center of the dough and check that your circle is about the right size. The dough will be about as thin as a cracker. 8. Roll the dough around the rolling pin. Lift the pin up and center it over the pie pan, then unroll the dough into the pan with the fold in the center of the pan. Now unfold the dough against the inside of the pan and pat the dough all around the inside edge to fit snugly. 9. 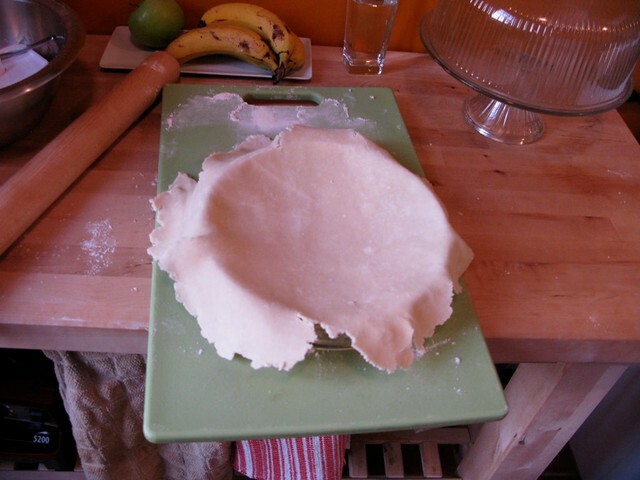 Fold the hanging dough back up onto the rim to make a double thickness of dough around the edge of the pan. Be careful not to tuck the dough under the edge of the pan, which would make it hard to dislodge after baking. 10. When you have neatly folded the dough all around the edges, press indentations into the dough, squeezing the edges together, to make a scalloped edge. [Note from Adam: I skipped this step!] Prick the bottom surface of the crust with a fork and proceed with a filling recipe. 1. 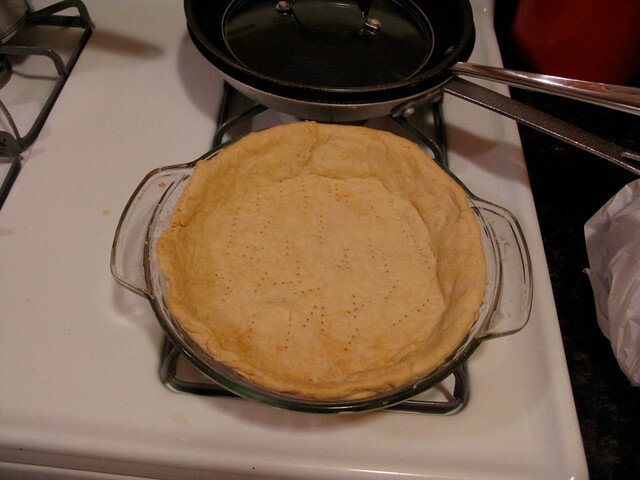 Once you have the crust in the pie pan, edges crimped and bottom pricked with a fork, freeze it for 20 to 30 minutes. 2. Prepare the filling by grating the zest from the lemons into a bowl. 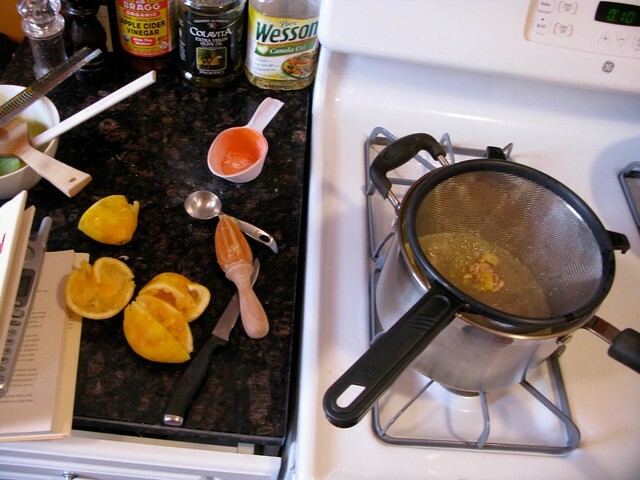 Strain in the lemon juice, then press through as much lemon pulp as possible. 3. In a heavy sauce pan, beat the eggs, yolks and sugar until just mixed. 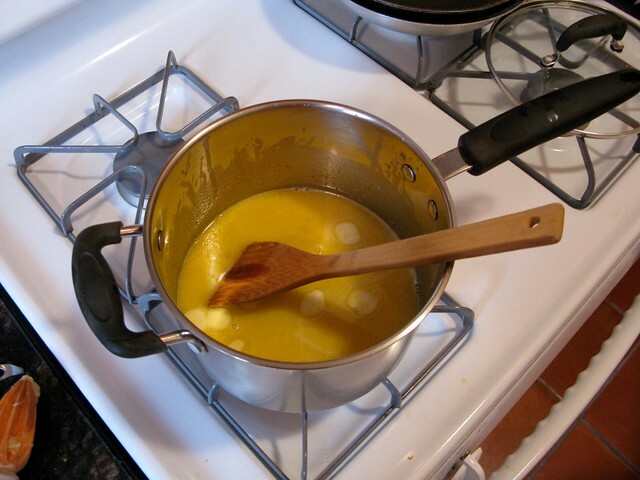 Stir in the lemon juice and pulp, then the six tablespoons of butter. 4. 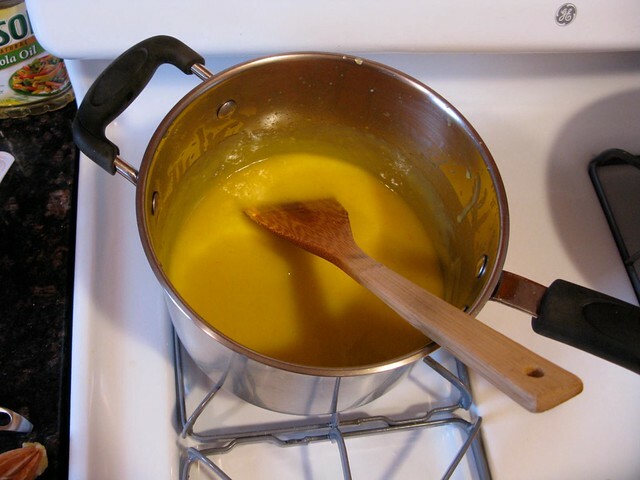 Cook, stirring constantly, over low to medium heat until the mixture comes together and thickens enough to coat a spoon. Remove from heat, allow to stand 5 minutes, then whisk briefly to smooth. Set aside. 5. Preheat the oven to 375 degrees. 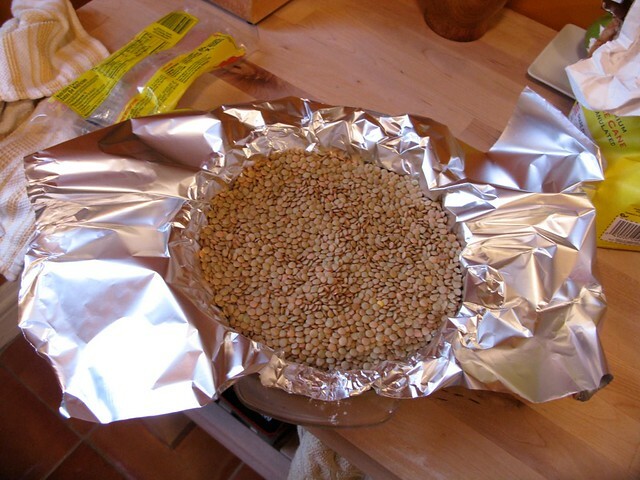 Line the frozen shell with aluminum foil, weight with beans [I used lentils] or pie weights and bake for 20 minutes, or until set and dry looking. Remove the weights and foil, turn the heat down to 350 degrees and continue baking until shell is golden brown, about 12 to 15 minutes. Set aside and allow to cool slightly, but leave the oven on. 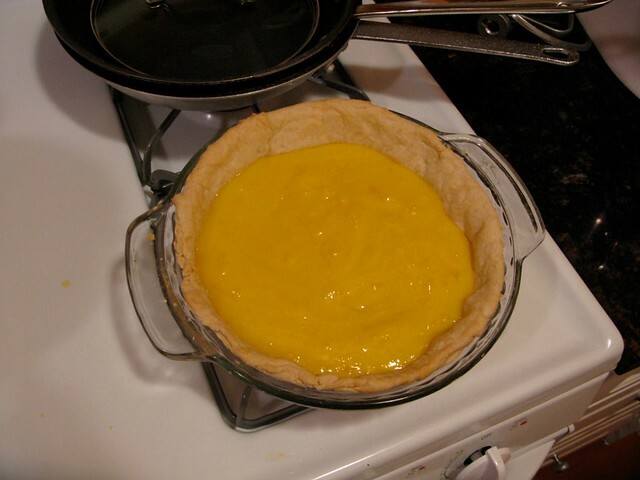 …and bake for 10 to 15 minutes or until the filling is just set. Remove pie and turn oven to 375 degrees. 8. 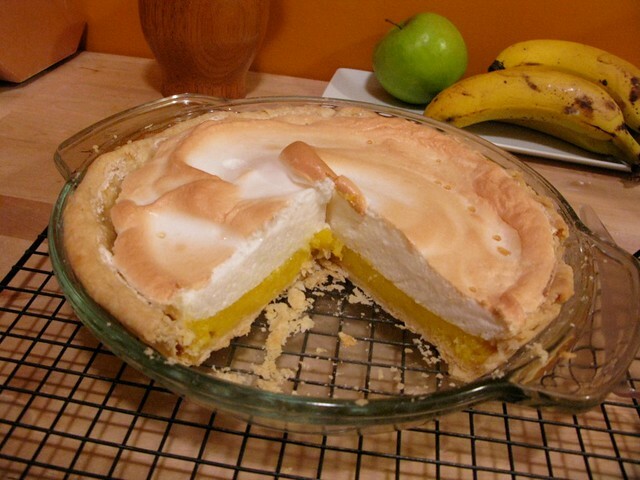 Spread the meringue over the filling, making sure it meets the edges of the crust to make a seal. 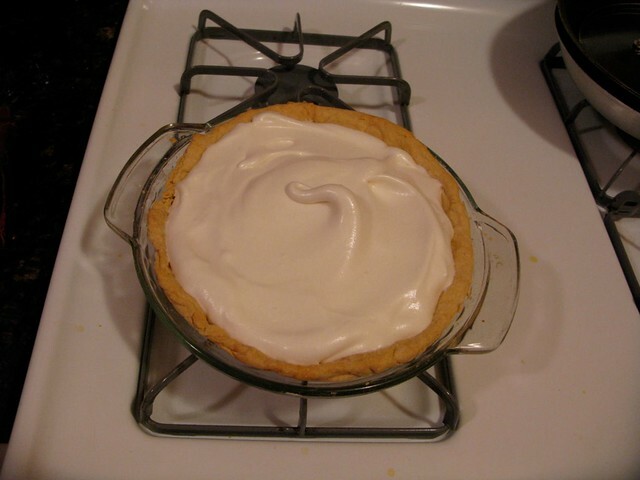 Swirl in a design with a spatula and bake for about 10 minutes, or until the meringue is lightly browned. 9. Allow to cool completely, but do not refrigerate. Eat and enjoy! It won’t last long.